Weather has not been kind to the Virginia football program, no matter who the opponent is, in this 2018 season. The Cavaliers dealt with a lightning delay in the season opening win over Richmond, a torrential downpour throughout last week’s loss at Indiana, and now the Hoos are headed to Nashville (TN) to take on Ohio in a game that was originally scheduled to be in Charlottesville. But because of fears of Hurricane Florence’s track, Virginia and Ohio agreed to move Saturday’s contest to Nashville, effectively making this a neutral site game. How resilient is this Virginia team? They are surely being put to the test. After a dominating win to open this year, Virginia suffered the disappointing loss at Indiana. The offense failed to get going against the Hoosiers, who scored three straight first-half touchdowns and held on to defeat the Hoos for a second consecutive year, 20-16. On Saturday, September 15, Virginia gets to take on the Ohio Bobcats, the preseason favorite to win the MAC. Head coach Frank Solich, who is in his 14th season as Ohio’s head coach, leads a program that went 9-4 in 2017. The Bobcats return eight starters on offense, including its starting quarterback, running back, two wide receivers and four offensive linemen. Ohio has four defensive starters back – linebacker Evan Croutch, who had an interception in week 1 of this season, and three defensive backs — from last year’s group that was ranked 10th in the country against the run. The Bobcats also welcome back their starting punter and placekicker – the former (Michael Farkas) averaged 40.1 yards per punt last season, while the latter (Louie Zervos) made 15-of-18 field goals a year ago. The Bobcats received a scare from the MEAC’s Howard Bison, a program led by former Virginia head coach Mike London, in their 2018 season opener on September 1. Ohio ultimately rallied from 16-3 down to take down the Bison, 38-32, thanks in part to top performances from backup quarterback Quinton Maxwell (233 yards passing, 4 TDs total) and wide receivers Papi White (8 catches, 154 yards, 1 TD) and D.L. Knock (100-yard KO Return TD). Ohio (1-0) was on a bye last week while Virginia traveled to Bloomington. The Cavaliers (1-1) are looking to bounce back and get the record back above .500 before embarking on Atlantic Coast Conference play next week against Louisville. Weather permitting, of course. For updated information on this week’s contest in Nashville, see below. 1. Can Virginia win in the trenches? On defense, the line had trouble defending the correct lanes, which led to Indiana churning out 237 yards rushing. True freshman Stevie Scott enjoyed a breakout performance, with much of his 204 yards rushing coming on runs in between the tackles. Virginia had real trouble getting off the field in the second half because it couldn’t contain Scott, who racked up 140 rushing yards in the second half alone. We’ll see if a thin and relatively inexperienced Cavalier defensive line fixed those mistakes within the past week. On the other side, the Virginia offensive line needs to get consistent push. This year’s Cavalier offense is going to succeed or fail with how well it runs the football. Virginia managed 188 yards on the ground last week against Indiana, but 47 of those came on an early burst from quarterback Bryce Perkins. 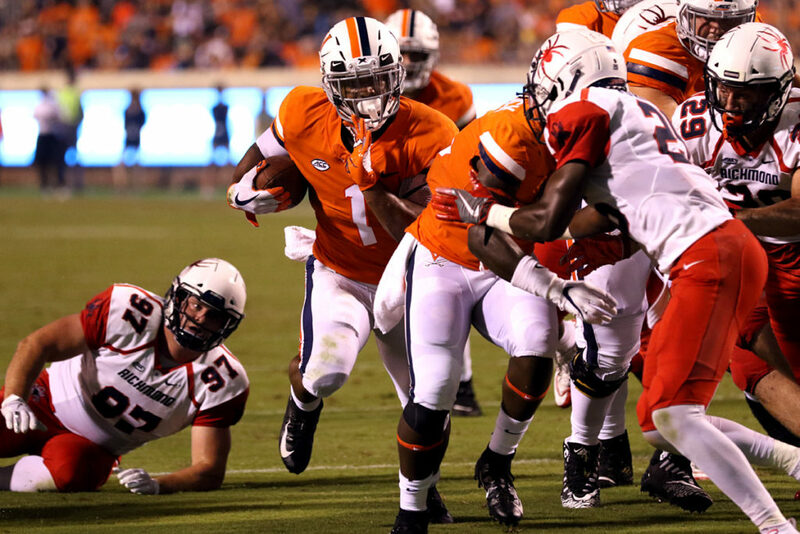 Aside from that play, UVA gained only 141 yards rushing on 38 carries, an average of 3.7 yards per carry. Ohio ranked 10th in the nation in run defense last season, when it allowed a mere 110 yards per game. The Bobcats, who surrendered 161 yards on the ground in this season’s opener against Howard, are trying to replace six of seven starters from last season’s front seven. This seems like a prime opportunity for the Cavalier offensive line to shine, so let’s see if they take advantage. 2. Will more playmakers emerge in the passing game? Perkins has completed 26 passes for 297 yards and four touchdowns in two games this season. Olamide Zaccheaus and Hasise Dubois are responsible for 18 catches for 201 yards and three scores. Dubois’ emergence is a positive, and you can see Perkins trusts him in important situations. Zaccheaus is typically outstanding, last week aside. But what about Joe Reed, De’Vante Cross, Tavares Kelly and others? Reed has two catches for 34 yards, but neither Cross nor Kelly have a catch so far this year. Virginia is going to have to establish a solid pass game to compliment its rushing attack, but that will be difficult to do if more wide receivers do not start making plays. 3. How will Ohio quarterbacks react to the Howard game? I’ve never been a fan of a two-quarterback system. It doesn’t look like Ohio’s starting signal caller Nathan Rourke is a big fan, either, judging from his comments to The Post, a newspaper based in Athens, Ohio. At least, he wasn’t thrilled with what transpired against Howard. Rourke captured the Bobcats’ starting quarterback job with a terrific 2017 campaign in which he earned All MAC second-team honors and was fourth in total offense. But after he opened the Howard game with three subpar series, he was replaced by fellow junior Quinton Maxwell, who played the rest of the way and led Ohio to a comeback win over the Bison. Click here to view the full article by The Post. Rourke has been named the starter for the Virginia game, but Solich has indicated both quarterbacks will get opportunities. How will last year’s star respond? It may motivate him to play better. After all, he took the job from Maxwell in last season in similar fashion. It may backfire, now allowing either player to get in a rhythm, and ultimately hurting the offense’s chemistry. I’ve certainly seen the latter at Virginia (Rocco/Watford from the London years is a great example). Maxwell played well against Howard. Rourke, though, is the one I’m most worried about if I’m Virginia. He seems upset about what transpired in the season opener, and I’m guessing he is going to come out ready to play at a high level against the Hoos. When he is on he is capable of beating a defense in multiple ways. He passed for 2,203 yards and 17 touchdowns and rushed for 912 yards and 21 scores in his breakout 2017 campaign. Kitrell played in 10 games at guard as a true freshman last season before earning a starting role at center this season. His play figures to be key in Ohio’s in-between-the-tackles running game with the productive A.J. Ouellette. Although Virginia’s defensive line is short on experienced players, the 6’3”, 297-pound sophomore will face a stiff test against the Cavalier front seven this week. We’ll see how he responds to what Coach Mendenhall has in store. Hagan, a strong safety, started all 13 of Ohio’s games last season, totaling 85 tackles (45 solo) and 8 pass breakups and earning 2017 All Mac second-team honors. The 6’1”, 210-pound redshirt junior missed the 2018 season opener versus Howard because of an injury. As one of only four returning starters from last year’s team, Hagan is expected to return for the UVA game and should be a welcome site for a unit that struggled big-time in week one. Cornerback Jalen Fox, who broke up 13 passes and corralled two interceptions last season, is another returning starter in the secondary to keep an eye on. Bryce Perkins adds a big-play dimension to the running game and has certainly shown he can run the football well, whether he is in the open field or slicing through traffic. But for me, the key to this Cavalier rushing attack is Jordan Ellis. If Virginia can establish Ellis up the middle, it opens up so much more for Perkins and others on the outside. UVA’s offense needs to feed the hard-nosed senior early and often. Zaccheaus is coming off a subpar outing against Indiana, especially by his standards. He did have one touchdown, but he had several bad drops, including one that would have kept Virginia’s momentum going after the Hoos had cut the lead to 20-16 and gotten possession back on a Juan Thornhill pick. I look for the speedy senior to rebound with a big-time effort against the Bobcats. I’m going with offense for all three “Hoos To Watch” because, while the defense had some struggles against the Hoosiers, the offense has more questions to answer. Tavares Kelly drew rave reviews for his speed and playmaking in the preseason; however, he has yet to make a catch and has only one carry for 4 yards. Virginia needs to find more ways to get the talented true freshman the ball in open space and let him go. Virginia defeated Minnesota in the 2005 Music City Bowl held in Nashville, Tennessee? Virginia Football may have beat me to the punch via Twitter (see below); nevertheless, the memory of the Cavaliers’ victory over the Golden Gophers is a good one. UVA staged a fourth quarter rally, overcoming a 31-24 deficit and scoring the game’s final 10 points to capture victory. Quarterback Marques Hagans totaled 384 yards of offense (358 passing, 26 rushing) and passed for two touchdowns, securing MVP honors, while running back Wali Lundy tallied 16 carries for 59 yards and two scores. Lundy’s 2-yard touchdown run tied the game with 8:48 remaining in the game. Kicker Connor Hughes gave UVA a 34-31 lead with a 39-yard field goal with 1:08 to go, and cornerback Marcus Hamilton sealed the win with an interception in the final minute. Click here to view a condensed version of the game courtesy of One Hour Football ACC. You can also check out Virginia Football’s tweet below for several highlights, including Hughes’ game-winner and Hamilton’s pick. Go Hoos!